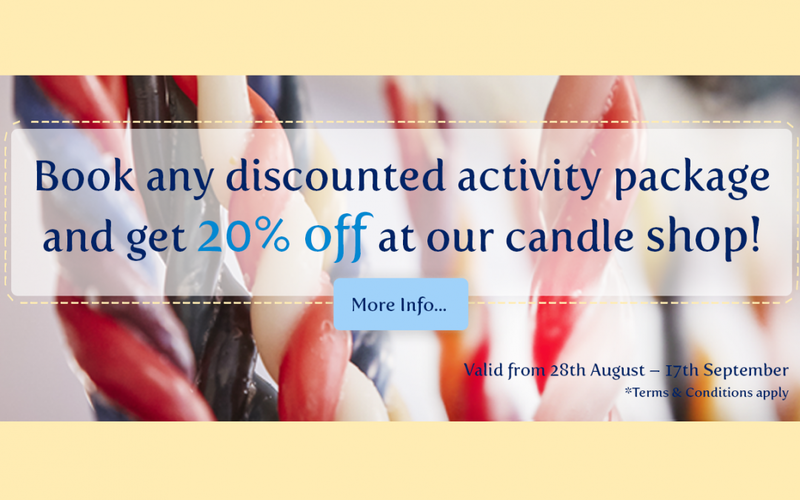 Get 20% off at the candle shop with any discounted activity package! Home | Get 20% off at the candle shop with any discounted activity package! Cheshire Workshops have the perfect activity packages to keep the whole family busy this summer and now you can take advantage of 20% off at our candle shop too! With the Summer holidays well and truly in full swing, you might find yourself struggling with how to keep the kids entertained. At Cheshire Workshops we offer a range of exciting packages that leave your children far from bored. All of our packages are suitable for both children and adults, all leaving you with a handmade souvenir to go home with. Depending on which ticket you choose you can take home twin or triple twist candles, tea light holders, decorated candlesticks, keyrings, badges, painted pottery or sand art. We have three options for our activity packages, yellow, green or blue, all affordably priced and providing you with a full day of fun. Our packages range between £11 – £13, all giving you the chance to try a variety of activities. We’re open from 10am until 4pm throughout the summer holidays, so make sure you pop by and say hello. Our latest offer will be running from the 28th August, all the way up until the 17th September. When you come by and buy one of our discounted activity packages, get a 20% discount on any item purchased from the onsite candle gift shop. The candle gift shop provides both adults and children with an array of giftware, pottery and home furnishings. Where our personalised candles give you the perfect gift for that wedding or christening you’ve got coming up, our home furnishings can give your home that little extra splash of colour and traditionality. Our expert candle makers can create your very own personalised candle, ready for you to take away there and then. Or, you can send us your requirements and we’ll ship it to the address of your choice. If your big day is coming up, take a look at our range of exquisite wedding candles for the wedding venue itself and the reception too. If you’re in the Greater Manchester or Cheshire area, looking for something to keep the family entertained and want to try something new, come down to Cheshire Workshops and be sure of a fun day out. For more information, contact us on 01829 770401 or fill out our online contact form and one of our team members will come back to as soon as possible. *Offer excludes previously discounted items and applies to purchases made from the candle shop on the day that the ticket was purchased.